Tulasi is a devotee of Krishna who appears in the form of a plant, specifically a shrub of the mint family (botanical name: Ocimum tenuiflorum or ocimum sanctum, "holy basil"). Tulasi plants are dear to Krishna Himself and are important to the practice of Krishna consciousness. The process of Krishna Deity worship includes placing tulasi leaves on offerings of food to Krishna, decorating Krishna's form with garlands of tulasi buds (manjaris), and directly attaching tulasi leaves to His feet with sandalwood paste. Krishna devotees customarily wear neck beads made from tulasi wood and meditate daily by chanting Krishna's names on strands of tulasi wood beads. - One of Krishna’s most intimate servants comes in a special form to bless us with extraordinary fortune. - The luxurious growth of one of Krishna’s greatest devotees, who appears in a special form, attests to the devotion of two of her dedicated caretakers. - Why Krishna devotees always wear Tulasi. - a helpful blog dedicated to maintaining Tulasi for worship of Krishna. "Let me offer my respectful obeisances unto the tulasi tree, which can immediately vanquish volumes of sinful activities. Simply by seeing or touching this tree one can become relieved from all distresses and diseases. Simply by offering obeisances to and pouring water on the tulasi tree, one can become freed from the fear of being sent to the court of Yamaraja [the King of death, who punishes the sinful]. If someone sows a tulasi tree somewhere, certainly he becomes devoted to Lord Krishna. And when the tulasi leaves are offered in devotion at the lotus feet of Krishna, there is the full development of love of Godhead." "Tulasi plants and their leaves are very important in devotional service. Devotees are recommended to water the tulasi tree every day and collect the leaves to worship the Lord." "One can sow tulasi plants, because tulasi leaves are very important and Krishna has recommended this in Bhagavad-gita . . . Krishna desires that one offer Him either a leaf, or a flower, or fruit, or a little water—and by such an offering He is satisfied. This leaf especially refers to the tulasi. So one can sow tulasi and pour water on the plant." " . . .tulasi is given special preference by the Lord, who garlands Himself with tulasi leaves." "One should worship the Lord by offering pure water, pure flower garlands, fruits, flowers and vegetables, which are available in the forest, or by collecting newly grown grasses, small buds of flowers or even the skins of trees, and if possible, by offering tulasi leaves, which are very dear to the Supreme Personality of Godhead." "It is specifically mentioned herein that tulasi leaves are very dear to the Supreme Personality of Godhead, and devotees should take particular care to have tulasi leaves in every temple and center of worship. . .
Tulasi leaves are very important in the method of worshiping the Supreme Personality of Godhead . . .tulasi leaves are very important for satisfying the Lord, so as far as possible an arrangement should be made for growing tulasi leaves." "Sri Krishna, who is very affectionate toward His devotees, sells Himself to a devotee who offers merely a tulasi leaf and a palmful of water."" "Through devotional service one can easily please Lord Krishna with a leaf of the tulasi plant and a little water. . . Srila Advaita Acharya knew this fact, and therefore He decided to call for the Personality of Godhead Krishna to descend by worshiping the Lord with tulasi leaves and the water of the Ganges." 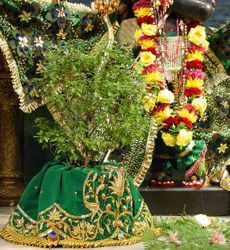 "[Narada Muni continued:] After planting the tulasi tree before your house, you should daily circumambulate that tulasi plant, serve her by giving her water and other things, and continuously chant the Hare Krishna maha-mantra.’"
" . . .the process of chanting the Hare Krishna maha-mantra with a vow before the tulasi plant has such great spiritual potency that simply by doing this one can become spiritually strong. . . Chanting sixteen rounds does not take much time, nor is offering respects to the tulasi plant difficult. The process has immense spiritual potency. One should not miss this opportunity." Why do people worship tulasi plants? Why is tulasi given so much importance in spiritual life? What if I don't have a tulasi plant? Can I still worship Krishna? How does one chant Hare Krishna on beads? How does one properly grow, care for, and use tulasi to worship Krishna?